Costa Bingo is a giant in the world of online bingo. The ‘as seen on tv’ site has paved the way for the game since it’s launch in 2006. It is most recognisable for ads featuring an oversized Mel B and Johnny Vegas as the voice of Sunny the Sun. The site runs the Dragonfish software and gives users a choice of lobby, making it easier for mobile and tablet users. It’s also home to a fantastic chat software with a selection of chat games and ‘tourneys’ to keep you entertained. The site has giant jackpots too, making you only one step away from ‘your funshine destination’. New player offers don’t come around like this very often. We’ve got here 4, yes FOUR offers that you can use, one after the other when you sign up with Costa Bingo today. 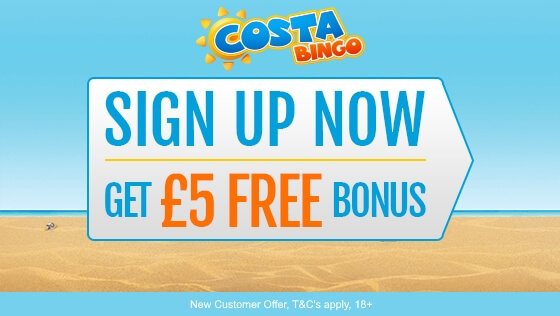 Receive a free £5 bonus on signup when you click the picture below and head on over to Costa Bingo. Short and sweet and just what we like. Don’t go scrambling the internet for a Costa Bingo promo code, you don’t need one. Simply claim now and signup to receive the £5 free bonus. Card details are required, but don’t worry – it’s perfectly safe and the first £5 is on them. No need to deposit a penny if you find it’s not your thing. Decided that Costa Bingo might be for you? It’s time to make your first deposit. What better way than with a freebie? Costa Bingo: Get 120 free bingo tickets on your first deposit! Time for that second deposit to top up your bingo funds? Glad you’re enjoying. Costa Bingo: Get 60 free bingo tickets on your second deposit! Coming in hot for a third deposit, might as well grab another freebie while you’re at it. Costa Bingo: Get 30 free bingo tickets on your third deposit! Bingo is available in 90 and 75 ball – industry standard for any online bingo site. It’s also home to 52-5 and 5 line bingo, giving a different feel to the site. 52-5 is played with a deck of playing cards. The first to cover all of their cards on one ticket wins the game. 5 line is exactly what you expect with a 5×5 ticket with the aim of crossing off lines at a time. There’s jackpots for 1, 2, 3, 4 and 5 lines in this game. The Costa Bingo mobile app is a great way to keep bingo on the go no matter where you are. At the beach, on the bus, in the bath or simply at lunch – you’ll be ready to play from the palm of your hand. There’s loads of 90 ball bingo games to pick and choose from the Costa Bingo mobile app, and they’re open 24/7. Play your favourite slots too with some new exclusive games available for mobile customers. Head over to the Google Play or App Store now and get downloading your very own virtual bingo companion. Slots and casino games are plenty with Costa Bingo bragging a wide variety. Choose from Rainbow Riches, Starburst and Temple of Iris among others in the slots section or head to Super Stakes Blackjack, Lucky Keno or American Roulette in the casino column. There’s plenty to pick from and everything is covered at Costa Bingo. Wagering with Costa Bingo can be difficult to take account of and you should always read the terms and conditions before signing up. Information written at the time of posting may also have changed, so don’t overlook the little things. E.g. if you wager £500 on Keno, only £450 (90%) contributes towards the wagering requirements. A maximum withdrawal time of 10 working days will be imposed, with wire transfers taking the longest time. The usual guideline is between 4-7 days business days before a withdrawal is seen in the account. A maximum withdrawal number of 10 per day is also imposed with minimum withdrawal of a particularly low amount of £5. A friendly customer support team is always available with a number of forms of contact, keeping you up to date with any issue you may have. Phone lines are open between 10:00 and 02:00 and will always be ready to address issues and solve problems. +12684 844 830 if you are outside the UK.